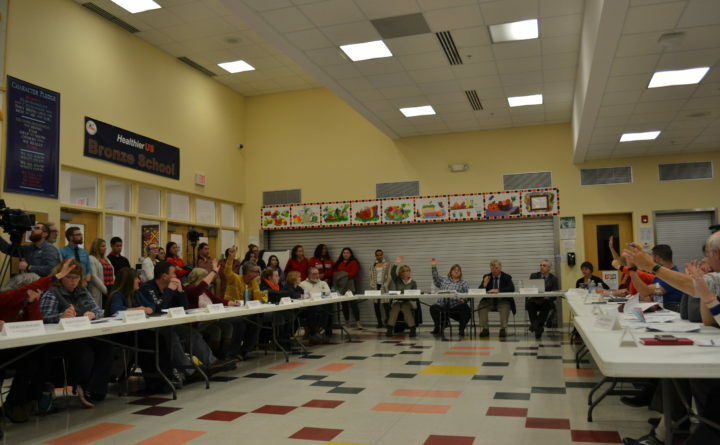 Members of the Skowhegan school board vote to approve a public forum on the mascot issue, to be held on Jan. 8, 2019. It appears that my community is going to rehash the debate about our school team’s nickname, the “Indians.” The lines are already drawn and positions staked out for a Jan. 8 community forum on the issue. Each side believes itself to hold the moral high ground, and each side believes the other to be evil incarnate. Many in this town see the issue as nothing more than an attempt by Native Americans to keep themselves in the spotlight by generating news over a name that the people in this town hold in deep reverence. Skowhegan children of many generations spent years in a public education system that infused them, daily, with “Indian” pride, “Indian” spirit and “Indian” tradition. They won and lost state championships, stayed after school to organize rallies, dances and bake sales, attended proms, and graduated from school as “Indians.” If you look at it from this perspective, it is easy to see why they would be aghast at the idea that this somehow shows disrespect or, worse yet, racist values. Others see this as political correctness gone postal. Just because someone decides to take offense at the use of a word does not, to them, mean that everyone has to stop using it. Would the Irish and Scottish people, all of whom are “Celts,” have a right to demand that the Boston Celtics change their name? On the other side is a nation of proud people witnessing the decline and degradation of their culture. Relegated long ago to small islands scattered along the American periphery, they have witnessed the erosion of everything they hold valuable. How do you instill pride and cultural respect among your children when a label, pasted upon you by the conquerors centuries ago, continues to define and stereotype? Who in any community, faced with the same cultural onslaught and attendant ravages of alcoholism, drug use and poverty, would not lash out at even perceived slights? Who would not use that opportunity to keep their desperation in the public eye? Like every other issue in our political landscape today, there is some truth and justice on each side. Like every other issue, no one seems willing to acknowledge as much. How then, do we make a decision when righteousness is equally distributed? Let me suggest a few guidelines. The people who get to decide what is an insulting word or phrase are not those who hurl it, but those who receive it. No matter how defensible our point of view, it is not our right to force that perspective on Native Americans. They are the ones who get to make that decision. Those who have prospered can afford to be generous. Although Skowhegan has had its cyclical ups and downs, it can afford the trauma of a name change. We have enough going for us that suffering through a short period of angst over the loss of a namesake will not even warrant a footnote in the history of this town. For Native Americans, it will be a another symbol of their disenfranchisement. Most importantly, no matter how right we are in our use of this namesake, its defense is going to be never-ending and require more and more resources. We have enough issues in public education to address without adding another. Forty years ago, we might have had a chance of putting the issue to rest, but not in an age of social media and instant news. Do we really want this to remain the big issue in our educational system? Surely, there must be something else in the school system that needs our attention more than this. Perhaps this little town out on the margins of America can show the country how to govern in a civil society. Maybe other states will see how closely Mainers still follow the New England way by accommodating its neighbors with compromise and cooperation. Alan Haley writes about economics and Maine life from his Skowhegan home.